What a surprise to come upon fiddlehead ferns in the supermarket today! Did I never notice unusual vegetables before? Or are supermarkets experimenting with new items? Three years ago, my family published a cookbook. My cousin Laura lives in British Columbia and has been a vegetarian for years and years -- though her four children and her husband are not -- and is an inspiring cook. 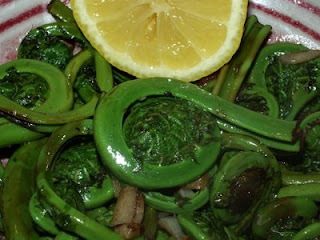 One of her many contributions to the cookbook was a recipe for fiddlehead ferns. So when I discovered these at the supermarket today, there was no NOT bringing them home (even at $10 a pound) and I knew right where to turn to learn how to cook them. Laura's recipe calls for scads of butter -- I just couldn't do it. But these were utterly delicious and so very, very pretty! Look at those curlicues! What do they taste like? I wondered that as I ate them tonight. They taste like nothing I've ever had before. The only words I know to describe the taste are 'green' and 'alive'. Keep your eyes peeled, decide for yourself. 2012 UPDATE: A careful reader suggests reading the comment, below, from Emily about the risks of under-cooking fiddlehead ferns. In fact, Health Canada has issued a notice about this, see Food Safety Tips for Fiddlehead Ferns. My own experience with fiddlehead ferns is limited to this one occasion, but I don't think my cousin would have put them into a family cookbook without good experiences herself. Melt butter in a skillet over MEDIUM until shimmery. Add garlic and saute until just beginning to soften. Wash ferns well and add to skillet. Saute about five minutes. The USDA database includes a listing for fiddleheads (both fresh and frozen) but no underlying nutrition data. With a tablespoon of butter for two servings, I counted 1 serving as 2 Weight Watchers points. I study ferns, so I'm thrilled to see fiddleheads listed here, but I would like to caution readers against cooking them for only 5 minutes: most ferns contain loads of carcinogens and other nasty chemicals, but the edible fiddleheads found in supermarkets all belong to the same species, the only one considered edible by experts. However, it is recommended that even these be boiled for at least 10 minutes or steamed for 15-20 before being sauteed in butter (which is certainly the most delicious way to have them!). Over the years there have been scattered, but persistent, reports of people experiencing mild-to-worse food poisoning from consuming under-cooked fiddleheads, hence the note of caution! I think you should put a notation in your recipe for the fiddleheads about what Emily wrote. Because what she wrote is very true. And I didn't see where you added the additional info, so please add so people don't end up very very sick or worse.